Although a program cannot contain spoilers, it should still give us an idea about the play’s content. In the case of “Infinitely Yours,” written by Darci Faye, its name and synopsis contain too much ambiguity. Portraying a woman fighting her feelings for a man she loved in high school, it could be a happy tale of reunion, or a sad story about love that was never meant to be. Such are the audience’s expectations, based on the play’s name and brief description. While either version would be equally compelling, “Infinitely Yours” takes an unexpected twist in a grimmer direction. It focuses on domestic violence and manipulative, unhealthy love. On the one hand, this topic makes for a good drama that cannot leave the audience indifferent. On the other hand, it may upset those who expected a romantic love story and came unprepared for violence. With that said, slightly misleading synopsis ends up being the play’s only flaw. “Infinitely Yours” works well as a story. Each scene organically leads into another, and the pacing is just perfect. Hence, the show never fails to keep the audience’s attention, making us wonder what happens next. Furthermore, when one is abused and scared, getting away from the abuser often proves difficult. Hence, the spot-on title turns macabre instead of being sweet, which adds more depth to the story. The play opens up with Emily (Deb Radloff) returning to her hometown to take care of her mother. Right off the bat, she runs into Jason (Andrew Hutcheson), her high school sweetheart, which reminds her why she left her small town in the first place. Catching up with Jason over a cup of coffee, Emily finds out that he bought his parents’ house for $5,000. While she moved to New York to have a totally different life, Jason stayed in the same town and in the same house, which blows her mind. Thus introducing the theme of change, the play will later raise questions about how much we actually change. Even though Emily is uncomfortable with Jason and it bothers her when he calls her “Em-Em,” like in the good old times, she is still attracted to him. Moreover, Jason is attracted to her as well. His eyes look naughtily at Emily, and she says, “You’re creeping me out when you’re staring at me like that,” to which Jason responds, “You just have the same sparkling eyes that I’ve always loved.” The way these two look at each other makes us think this will be romance, and we can’t help but wonder why Emily is so uneasy in Jason’s company. However, when we meet Jason’s wife, Tasha (Maria Tholl), we slowly begin understanding why. Tasha is a nervous young woman, awkward around people. Later on, when we see her undress and change clothes, we notice a fist-size bruise on her left shoulder; then a bandage around her ankle, and finally, a sling on her left arm. Revealing these signs one by one allows Ms. Faye to introduce the theme of domestic violence discreetly and unobtrusively, which has a powerful effect on the audience. Another theme the play explores is unfaithfulness, first introduced by “You Know I’m No Good” by Amy Winehouse. Since Emily has repeatedly cheated on her fiancé, Derek (Kevin Kiler), it makes sense for him to leave everything in New York and rush to Maine to be with her as soon as she does not return his calls late in the evening. Naturally, his arrival causes more drama, keeping the audience guessing how this whole mess resolves. On an even deeper level, “Infinitely Yours” explores relationships in comparison. While Jason excites Emily, as she tells Tasha, he “can be intense sometimes” (read: violent). Derek, on the contrary, is stable and respectful, but he is a workaholic and does not spend enough time with his fiancée. 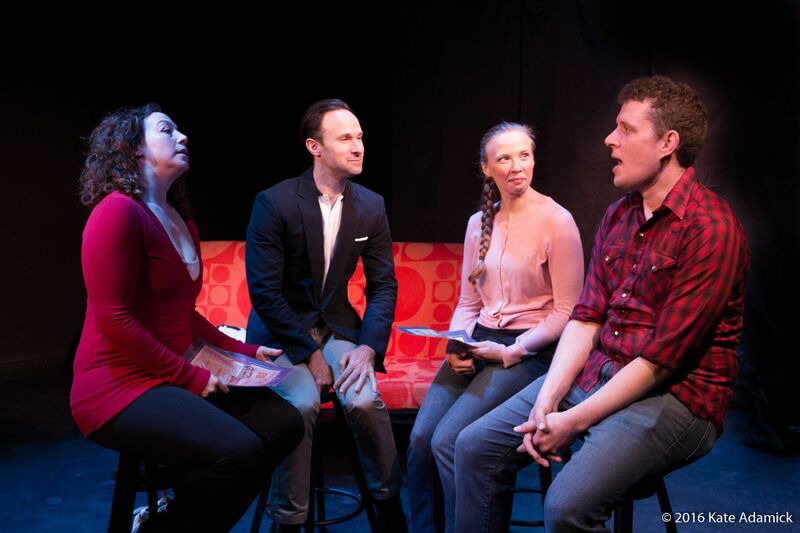 This struggle to find a perfect, or, at least, most suitable relationship is something anyone can relate to, and it strikes a note in the audience’s hearts. Due to the nature of their drama, the actors have to portray a wide range of emotions, from misery and discomfort to happiness and hope. More specifically, the two most memorable moments are when Tasha is beaming at the thought of being able to escape from Jason, and Emily crying at the realization that she cannot. In contrast to all these complicated emotions, the play’s setting remains simple and barely noticeable. The couch turns into a bed to take us from one house to another, and round stools signify, at different times, a coffee shop and a restaurant. Inconspicuous as it is, the change of scenes never takes the audience’s attention away from the action. To sum it all up, the creative team and the cast of “Infinitely Yours” does a great job putting together a well-thought-out and memorable show. It speaks to our compassion and raises important issues about love and relationships, especially dysfunctional ones. At the same time, it does not overdramatize abuse, which often happens in similar stories. A play like this could only benefit from a preview that would mention domestic violence, both to attract the right audience and to do the show more justice.